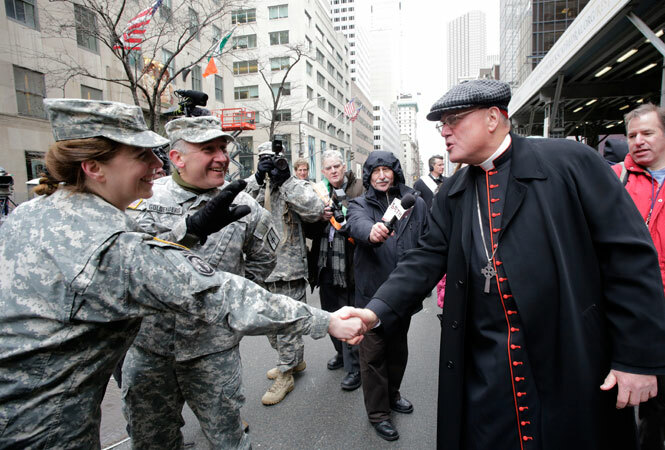 In this March 17, 2014 file photo, Cardinal Timothy Dolan, right, greets National Guardsmen at the St. Patrick’s Day parade in New York. Dolan’s position on the parade is the latest of his gentler comments on gays and lesbians. Last year, Dolan was asked on ABC’s “This Week” about gay and lesbian Catholics who felt rejected by the church. “Well, the first thing I’d say to them is, ‘I love you, too. And God loves you. And you are made in God’s image and likeness,'” Dolan said. The parade has no direct ties to the church, but celebrates a Catholic saint and has always been a key event for the city’s Irish Catholics. Lawler said the New York parade is more of a civic event that has already lost much of its ties to religion. “Why don’t we just admit it has no religious significance?” Lawler said.